Microsoft's Internet Explorer officially has an anime heroine called Inori Aizawa and people are already coming up with tons of fan art of her. This is the Internet. There's no such thing as turnaround time here. So far we've found a lot of artistic interpretations and GIFs—usually the first wave after a shocking reveal like yesterday's—but there's already some cosplay, too. See the two anime ladies featured in the background below? 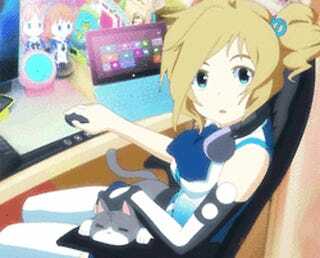 That's a cameo of the other Microsoft anime mascots, specifically for Windows 8, Yu and Ai.